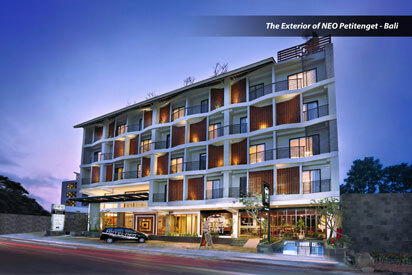 (Jakarta, October 29th 2014) - Adding an exclusive address to their portfolio of limited service hotels in Bali, Archipelago International announced the opening its third Hotel NEO in Bali, this time in the swanky Seminyak area. Just north of buzzing Legian, Seminyak is the upmarket cousin to Bali's famed tourist area, where luxury accommodation and fashionable high-end restaurants and bars scatter the main Petitenget strip. The atmosphere is much more sophisticated and laid-back and the beach in particular is quieter during the day, with high-end spas, boutique shopping and award-winning restaurants at every turn, making it a hotspot for Bali's younger, fashionable travelers. Located at the heart of the trendy area and set to become one of the only select service hotels in this otherwise exclusive district, Hotel NEO Petitenget will be a designer budget hotel with a non smoking concept throughout. It is ideally situated amidst Petitenget's myriad of shopping, dining and entertainment options, and it offers a trendy yet friendly atmosphere, cheerful yet professional service and a range of facilities in line with Hotel NEO’s credo that good and well-designed hotels do not need to be expensive. Each of the 101 air-conditioned rooms and suites at Hotel NEO Petitenget include mini bars and safes, beds with Select Comfort mattresses, complimentary wireless high-speed internet access and 32-inch LED TVs equipped with cable channels. All accommodations provide desks and phones and, in the bathrooms, guests will find bathrobes, slippers and designer toiletries. In-room refrigerators, coffee/tea makers and complimentary bottled water are also provided. The new NEO concept which was launched by Archipelago International in February 2011 opens the door to a whole new world of wellbeing and sensation. Designed in a modern contemporary style befitting the new trends in hotel design, NEO Hotels offer uncluttered open spaces that create an atmosphere of relaxation and revitalization in trendy but reasonably priced new build hotels and resorts. “More frequently, today's modern consumers regard an economy class but well designed, interesting hotel as an acceptable, preferred alternative to a larger and more expensive 4 or 5 star hotel. 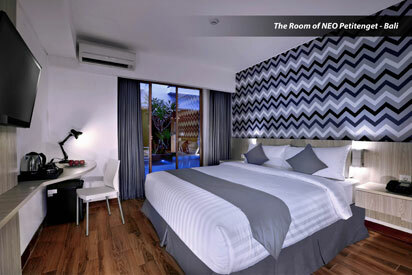 With this in mind, Hotel NEO Petitenget will be a perfect match for Seminyak's upmarket Petitenget area, where budget hotels are rarely seen but are in high demand from today's savvy travelers.” Said Mr. John Flood - President & CEO of Archipelago International.